Restaurant Review: Fire on the Monon - NCHS Live! There’s a fire. And it’s on the monon. With it’s bright red exterior featuring flames, Fire on the Monon is not an easy restaurant to miss. Fire on the Monon is a standard burger joint with the Indiana-classic baked tenderloin. Fire on the Monon has been a staple of the Broad Ripple food scene for many years. It is a restaurant that has been around for a relatively long time. While its interior designing can only be described as “bland,” the food is anything but. 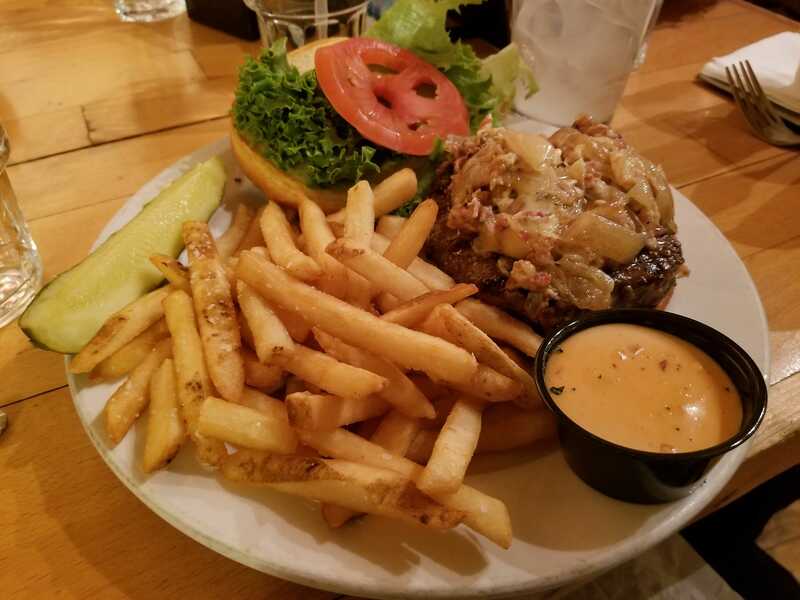 With interesting ingredient combinations in the burgers and an assortment of specialty items on the menu, Fire on the Monon is one of Broad Ripple’s top restaurants. The one thing that was common between the four dishes reviewed was the fries and chipotle mayo dip. The mayo dip was an interesting change from the standard ketchup. But the fries and dip are the only part that all dishes match. The Bacon Bleu burger, so called for its mix of Applewood smoked bacon and melted blue cheese, was an amazing dish, as the bacon, caramelized onions and bacon went extremely well together. The bacon was chewy, as it should be, and the bleu cheese had the right amount of bite and flavor. The Inferno Burger was by far the most interesting of the burgers on the menu. With its ghost pepper cheese, one would expect the burger to be as hot as the surface of the son, but the mix of cheese and the pepper subdues the spiciness of the pepper, but not the flavor. 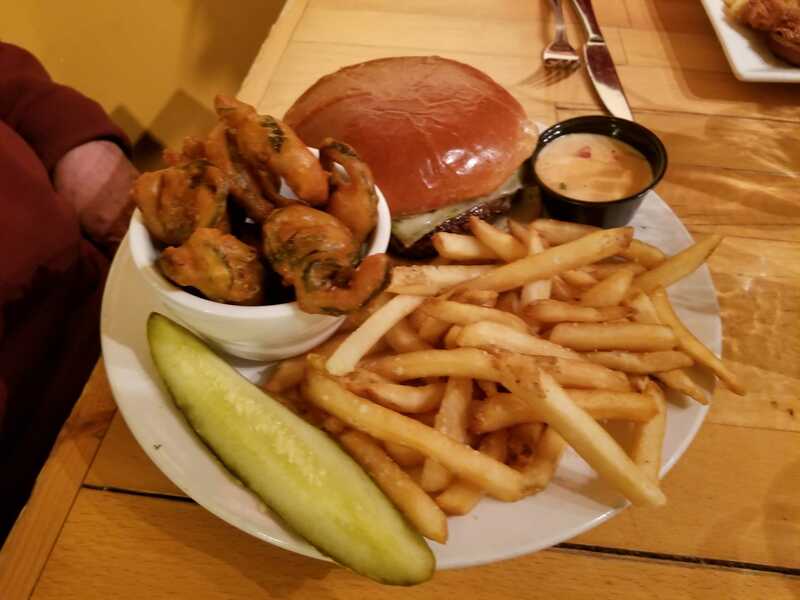 In addition, the burger came with “Poppers.” These were flash-fried jalapeno slices that could be on the burger or on the side. Because the peppers were flash fried, the spiciness, while not being completely gone, was somewhat removed. An Indiana classic, as it originated in this state, the Breaded Pork tenderloin was massive, as it should be. The tenderloin was mixed in the right amount of batter and cooked just the right way. The tenderloin was juicy and delicious. Finally, the Smoky Bear. 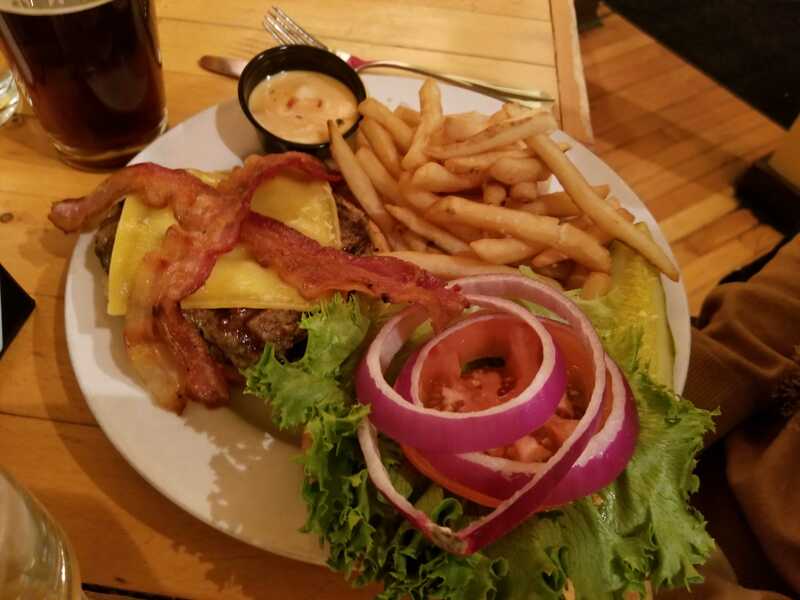 Another burger with bacon, but this time with gouda cheese, the Smoky Bear was a good burger, as the onions and tomatoes went well with the bacon and cheese.